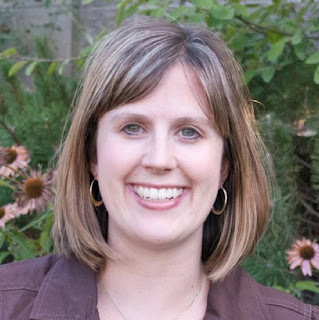 Meet Laura, the blogger behind Real Mom Kitchen! I have had the pleasure of meeting Laura in person a couple of times and she is one of the most down to earth people I have ever met. She loves what she is doing and it shows. I first heard of her in a local newspaper and have been following her blog ever since. I wanted to get to know her a little bit more and she was more than willing to share her answers to my questions. Who is the inspiration behind your cooking? My mom, she is the one who taught me how to cook. What was the earliest food/dish you learned to make? If I had to guess, it was probably cookies. What is the one foot item you refuse to eat, no matter the circumstance? Candied yams - it is the one thing I just can't handle eating. I think it's a texture thing for me. What is your favorite summer dish to make? Grilled pizza. My family loves pizza and it is fun to make it on the grill during the summer. Plus, grilling it adds to the flavor. If you only had 30 minutes from pantry to table, what would you make? Hawaiian Haystacks. It is my family's favorite meal. I usually just throw the rice into my rice cooker, which is usually done in 30 minutes, but minute rice can get it on the table even faster. I usually make the sauce with just a can of Cream of Chicken soup and some milk. If I have any leftover chicken, I'll throw that in, but if not, no big deal. What staple is your pantry never without? Pasta. You can always whip up a quick dinner if you have some pasta on hand. Which recipe would you recommend from your new cookbook that is simple, easy, and a great addition to bring to a pot luck? The Chili Cheese Frito Salad - It's simple, easy, and I always get asked for the recipe. Another food blog, Mels Kitchen Cafe. Her cooking was similar to mine and I started my blog as a place to keep all my recipes. The new friends that I make. I have met an made new friendships with really great women from all around the United States. That's a tough one. I love posts that I have done about recipes that mean something to me, ones that remind me of my childhood or of a recipe handed down to me from my grandma - like my post for Sour Cream Chicken Enchiladas. Guess what? She has a cookbook out! I got a sneak peek of her cookbook and it is put together really well! There are over 40 full color food photos, which are a must in my opinion ~ This book covers everything from appetizers/sides, to breads, soups/salads, main dishes, and desserts. She even has a few 30 minute recipes, a plus for any real mom in the kitchen! What was the most challenging part of putting together a cookbook? First would be choosing the recipes. Then it would be getting all the photos done. What was the best part of putting together your cookbook? Seeing the finished product; it was so nice to see the fruit of my labor. It was a goal of mine for a while and it is so nice to achieve something I had planned on doing. When I am not working on my blog, I am usually washing dishes, cleaning my house, or take care of my kids. I have a special needs daughter who requires a lot of extra help, so that keeps me pretty busy. I do also like to read and watch television if I can squeeze some time in. Eclairs. I have loved them since I was a little girl. I love the crisp and chewy pastry along with the rich, creamy filling, finished off with the sweet and chocolately topping! It was a yummy treat I would get to have occasionally as a child from the ZCMI bakery. Now I can make my own whenever I am in the mood for them. Absolutely. It usually happens when I have too many things going on in the kitchen at one time. I usually check on something, thinking it just needs a minute or two longer and don't set my timer. Then I get focused on something else I have cooking and forget all about the other item that just needed a few more minutes. Thanks, Laura! It was great to get to know you a little better ~ She is truly a Real Mom who knows her way around a kitchen ~ Congratulations on your new cookbook! You can take a peek at her new cookbook and pre-order it on Amazon.com! Want to get a FREE copy of her cookbook? Laura is graciously giving one away to one of my lucky readers! Cookbook giveaway is open to all my US readers and will close July 27, 2011 at midnight, MST. I was given a PDF copy of her book for an honest review, which I can't wait to make recipes from! The winner will be randomly selected by Random.org and a hard back copy of Laura's book will be sent to the winner from Cedar Fort Publishing. I would LOVE this cookbook :) The concept is right up my alley!! I read her blog on a daily basis and would love to win a copy of her cookbook.. Very nice interview! And the book sounds great; and looks great! I love the cover. Just added "Real Mom Kitchen" to my RSS feed. I'd love a copy! I love your blog, too! I'm thinking this would be a fabulous cookbook to own. I've tried several recipes and I loved them all. A few of my favorites are Chicken Enchilada soup and dill weed bread. I would love to have one of her cookbooks. Love your blog!!! Have already added it to my favorites and have printed several recipes to try. Looking forward to many more! I would love a copy of your new cook book, i love using your recipes they are yummy!!!! I would love to win a book. I really enjoy this blog. This looks like a great cookbook! Thanks for the offer. Love Real Mom Kitchen!! Hoping to win her cookbook but if not, then I will get one on Amazon!! I follow Real Mom Kitchen on FB!! I follow Real Mom on RSS Feed too!! Going to check out her blog...right after I leave my entry here for the cookbook! Okay, I did all the entries...only I couldn't comment on the RSS feed, but I did sign up for an email subscription! Looks like a must have cookbook!! What a great looking cookbook! How exciting! I enjoy reading her blog as well. Some really great recipes that I have stock piled and hope to one day slow down and try some! I would love to win your cookbook! I am always looking for new recipes to try for a spice in life and something different and would love to try your recipes! I have been anxiously awaiting the release of this cookbook! Real Mom Kitchen was the first food blog I stumbled upon and have been a reader ever since. I love finding new food blogs. Thanks for sharing yours and a chance to win the cookbook! I would love one of these Cookbooks! Your recipes look like something everyone in my family would love. Thanks for the opportunity to win a copy of your cookbook. Oh yes! I want a chance at the cookbook! Gonna try the Mexican pulled pork from her site soon. I follow Real Mom rss via email. Thank you for the introduction to the creator of what sounds like a great cookbook. But, then, I always enjoy reading your posts. I follow Real Mom Kitchen on Facebook too! This cookbook looks awesome!! The recipes look so good and easy to make! Thank you!! Sounds like a great cook book. I've been following her site for quite awhile. Great interview and I'm looking forward to checking out her site! How cool to meet a fellow blogger and become friends - one of my favorite things about blogging, too! This sounds like a great cookbook! I'm so excited you are giving one away. I follow her blog and love her style of cooking. Would love to win her cookbook. I'd love to win her cookbook! Looks like a really nice cookbook! I follow Real Mom Kitchen on RSS feed. I LOVE her blog and already follow it! Great give away! Please enter me! Great post! I love hearing how they "came to be"
I am always looking for a way to get my recipes noticed! wow. I'm always looking for new recipes and this looks great. Thanks! I follow realmomkitchen of fb. I follow realmomkitchen on twiter. I'd love to win this! I've been following her blog for a while now! I LOVE Laura's blog and I would love to win her cookbook! 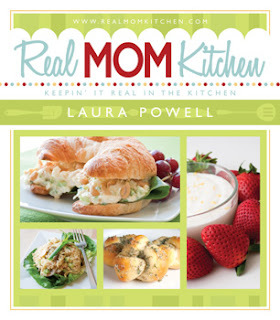 I have hear many great things about Real Mom Kitchen and look forward to reading more of her blog. Winning her cookbook would be awesome! I would love to win a copy of her cookbook! All her recipes look so delicious yet simple to make... right up my alley! I have been following her blog for awhile now and would love her book! What an awesome looking cookbook. I'm always looking for new ones to try. I'm following Real Mom on Twitter. I have been Laura's blog for a LONG time. She always has wonderful recipes. I would love to win her cookbook. I'd love to win a hard copy. I'm about to join the blog tour as soon as I finish editing my blog post. I made Laura's Mom's Orange Rolls. Yummo! Anyway, I was sent a pdf version of the book, but I much prefer a hard copy. Thanks for the great write up!! I'm way excited for this book! So cute!